Eötvös Loránd University (established in 1635) is the oldest and the largest university in Hungary. It is internationally recognized and its programs are accredited by the Hungarian Accreditation Committee. The diplomas issued by Eötvös Loránd University are acknowledged worldwide, and its course credits are transferable in all countries in the European Union. ELTE participates in the work of numerous university networks, such as AUF, Coimbra Group, AUDEM, CEI UniNet, UNICA and others. For the past six consecutive years, the Faculty of Humanities at ELTE is ranked first in Hungary on the official national ranking. In the past years, the Faculty of Humanities developed an innovative international strategic plan. The REACH project will be managed by the Atelier Department of European Social Sciences and Historiography, which operates within the Institution of History of the Faculty of Humanities. The department was founded in 1988 with the aim of helping student and faculty exchange between France and Hungary, following the fall of the Berlin Wall. Since its creation, Atelier has sent more than 60 students to study in Paris, and organized more than 100 international seminars and symposiums. Since 2012, the department has a specialization on The History and Practice of Cultural Heritage and since fall 2015, Cultural Heritage studies became an integral and autonomous master course of Atelier. The Atelier is an eminent centre of international cooperation (Erasmus, Erasmus+, Erasmus Mundus) within the History Institute and that of interdisciplinary research. Gábor Sonkoly – male - (1969) (CSc, Hungarian Academy of Sciences, 1998; Ph.D. EHESS, Paris, 2000; Dr. habil. ELTE, Budapest, 2008; DSc, Hungarian Academy of Sciences, 2017) is Professor of History and Chair of Historiography and Social Sciences at Eötvös Loránd University of Budapest. He is author of Les villes en Transylvanie moderne, 1715-1857 (2011), Historical Urban Landscape (2017) and published three monographs in Hungarian, edited four volumes and wrote some seventy articles and book chapters on urban history, urban heritage, critical history of cultural heritage. He presented at more than hundred international colloquia and was a guest professor in eleven countries. He is the Knight of the French Order of Academic Palms (2011). Eszter György - female - (1982) graduated in 2006 from French and Hungarian studies at ELTE University in Budapest and in 2008 at the Mention T.E.S.of EHESS, Paris. In 2013, she has defended her PhD thesis at ELTE on the identity of the so-called “8th” of the 8th district in Budapest and its Roma inhabitants. She is teaching in the TEMA+ Erasmus Mundus Joint Master programme and in the Cultural Heritage MA programme at Atelier Department, Budapest. Her recent researches are focussing on Roma cultural heritage and the history of Roma cultural movements in Hungary. Gábor Oláh – male- works as a research assistant at Eötvös Loránd University. His PhD research focuses on the concept of resilient urban community in a historical context. 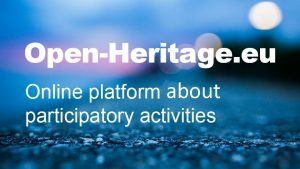 His main fields of interest are the role of cultural heritage in place attachment and the participative approaches in sustainable urban development. He speaks English, French and Hungarian.